​With differing opinions on carriers, I asked K to write a guest piece about the Baby K’Tan. Hopefully between the two write-ups you will find the carrier that best suits your needs! There is a very large, loud community of babywearers in Toronto. 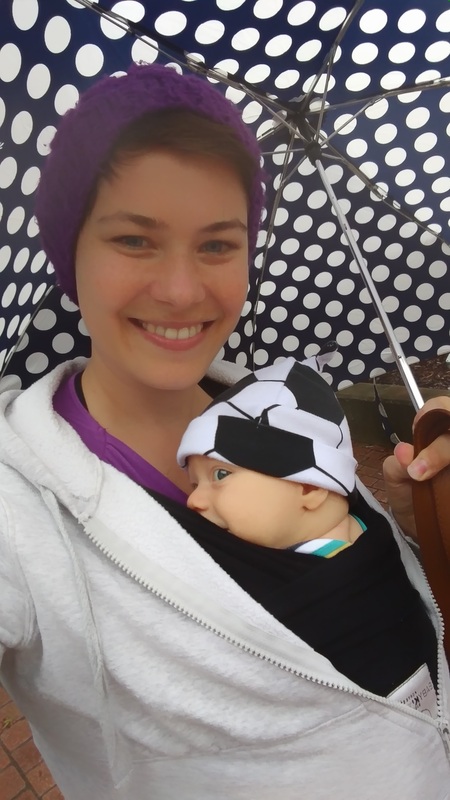 As a first-time mom-to-be I was interested and putting my son in a carrier but I was overwhelmed when it came to the options and the conversations around carriers. Like most first-time moms, before purchasing a carrier I reached out the other moms I know to ask their opinion. Reactions were mixed some moms telling me their babies hated carriers, while others told me carriers were a godsend and they wouldn’t have made it through the first year without one. 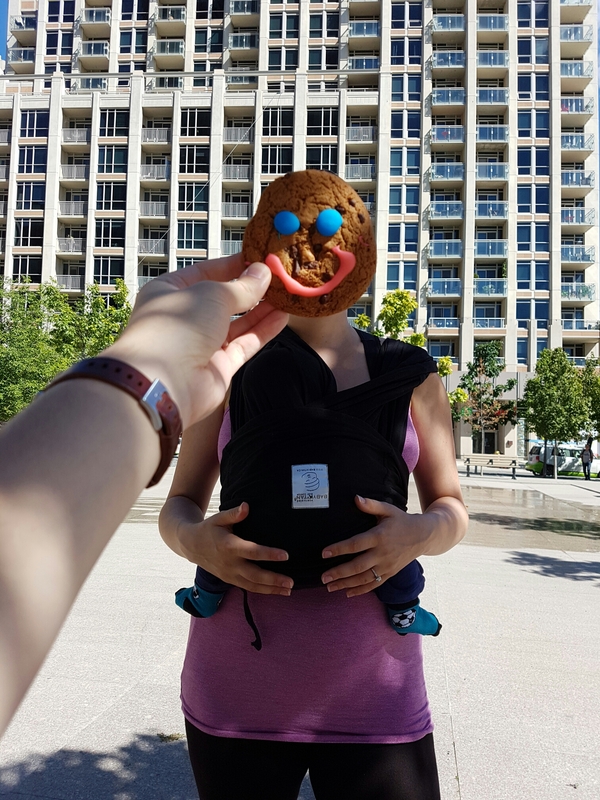 I was nervous about spending a lot of money on a carrier when my son would potentially not like to be carried; additionally my husband and I disagreed when it came to the type of carrier that would be best. I was interested in cloth carriers because I liked how intimate the carry seemed between mother and child. I liked the idea of having baby skin-to-skin while also being hands-free. My husband on the other hand really liked the idea of a structured carrier something like the Infantino or Baby Bjorn. We were finally able to settle our debate by purchasing two separate carriers a cloth carrier for me and a structured carrier for him. After much research I settled on the Baby K’Tan. Cloth carriers in general made me nervous because I was worried that I wouldn’t tie my son correctly and that there would be a possibility that he would fall or slip from a wrap style carrier. The Baby K’Tan carrier was a great middle ground in terms of being able to customize the type of carry while still feeling confident that my son would not fall or slip. I am actually wearing the Baby K’Tan as I write this. It’s part of our routine every morning. After an hour of play time and second breakfast for baby I scooped up T and put him in the carrier for a mid-morning nap. It is a great way for us to bond. He can still hear my heartbeat and the sound of my voice while I get a cuddle and still have my hands free to sterilize bottles, fold laundry and sometimes when I’m really lucky, watch an episode or two on Netflix. Because this carrier isn’t structured, I recommend only using it for a few hours at a time around the house or for a quick walk. If you’ll be out all day, get something structured, your back will thank you for it. One of the things I was really disappointed about after purchasing the Baby K’Tan is the sizing. Baby K’Tan recommends that you choose a carrier size that matches with your T-shirt size. Perhaps T-shirt sizing is different in the US but in Canada the medium size was way too large to safely wear my son. So we spent $150 on a carrier that should have been one of the cheaper options ($75 each). As much as I love using the Baby K’Tan every day I think this was a great learning opportunity in terms of reading reviews especially when it comes to sizing. My parents bought this for me in XS and I was excited to use it but it’s unfortunately still too big for me! My baby sits lower than I would like and the fabric isn’t tight around him. It was a miss for me but I think my mom will be able to use it.